Edited 12/5/11. It's been brought to my attention that I've mislabeled this product. The correct name is Jean a ma Jig. My apologies. Below is a series of pictures illustrating the jean a ma jig at work. 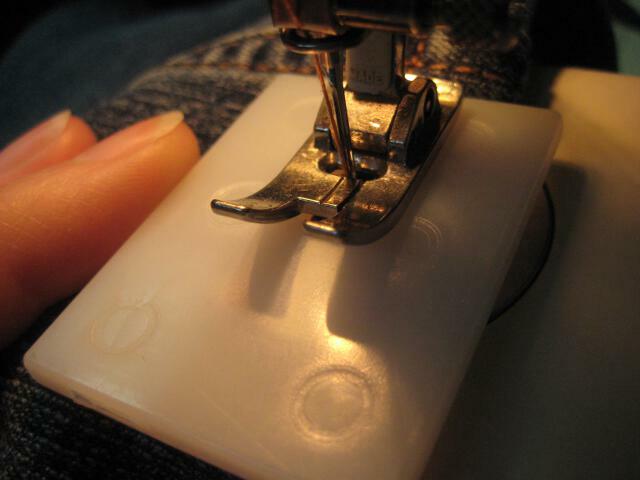 As you can see, you simply put it under the presser foot as you approach the large side seam of a pair of jeans. This levels the foot as you sew through all those layers. 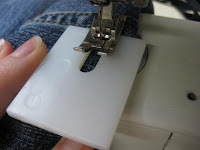 As you get through the "fat" part, set the needle into the fabric (needle down position) and switch the jean a ma jig to the front of the needle. Continue sewing until you get level again, in a "flatter" part of the hem. 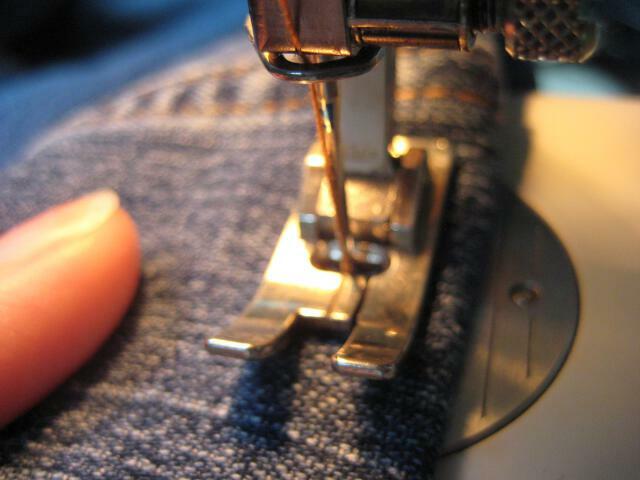 Remove it and continue sewing. This is a fabulous tip! I have never heard of a hump jumper but now i need one! You bet! It'll be the best $3.48 you spend. Wow! I've never heard of a hump jumper, but I definitely need one! This is wonderful. I had thought that something like was needed but had never seen one. That is my next purchase. I have a pair of jeans next to my machine that need it but I dreaded it. Thanks so much. My sewing machine has a hump jumper ability built in. There is a little button on the foot that I press. I had one of the plastic ones before that. LOVE the ability to do it on my machine. Yes, some machines have a "spring" on a presser foot that allows it to adjust to different thicknesses. Lucky you! The product listed above is not the Hump Jumper. The Humper Jumper is yellow, has a bend and is available from www.ssndesigns.com. Thanks for the correction, Sandra. 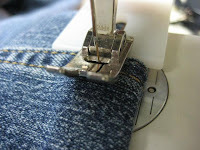 You're right, the picture actually shows the Jean a ma Jig.